Spirituality and self- knowledge. Ability to assimilate and analyze information, helps us to reconnect with our body by renewing our spiritual and emotional connections. Helps in setting and attaining new life goals. Spirit Quartz has a trigonal crystal system and is in the mineral class of oxide, the Quartz family. In its growth life, its first stage is the growth of the main Quartz crystal. In its second growth spurt, secondary and smaller crystals grow onto the first crystal. It is one of the newest healing tools in the gem world and can also be found under the name of Cactus Quartz. It is also sometimes confused with Faerie Points which looks similar but is actually Calcite on Calcite growth. If it's inexpensively priced, it is probably the latter and not Spirit Quartz. The coloring of the inner and outer crystals of Spirit Quartz can be varied. They do occur as clear, or white in their appearance. The purple to lavender varieties have iron included which makes them primarily Amethyst. If they have been exposed to, or near, a magmatic heat source they can also be yellow in their color which then makes them Citrine. First found by local South African tribes, it was named Spirit Quartz due to its similar appearance of mentholated spirits. To this date, it only comes from this one location. This scarcity and the shipping involved is what gives them their above average price in the market place. I have to say though, their energy is well worth the purchase price. 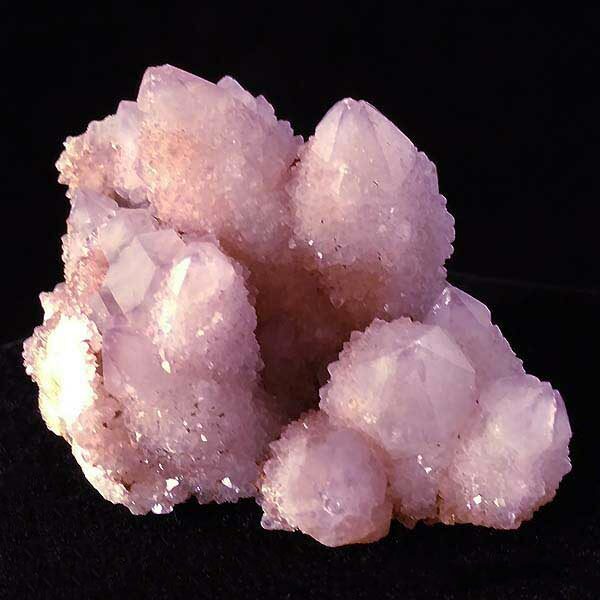 Spirit Quartz is excellent for use in meditation. It is also very helpful and stimulating as the centerpiece of a group healing circle. It can also be used as you would use Amethyst for physical or spiritual conditions. Spirit Quartz both opens and activates the crown chakra, and assists in channeling our desire toward spiritual goals. It further assists in adjusting and being comfortable in all situations. Spirit Quartz has been shown to provide protection of ones inner emotional structure. It brings about a calmness and clarity to our emotions and allows us to then have a clearer mental focus and get to the heart of matters we would like to resolve. Spirit Quartz allows one to see the duality of our nature, and to correct the negative, turning it into positive. It has been shown to assist in meditation, and in creating a strong connection with the inner and higher self. Spirit Quartz has all the healing aspects of Quartz and Amethyst, just intensified. In placing one in your hand it radiates out in all directions from the many tiny crystals covering the main crystal. It has been used in the treatment of skin disorders, colon disorders, in detoxification of the body, and in helping to resolve obsessive behavior patterns. Spirit Quartz has an affinity with all signs. It's Energy is Receptive, its planets are Jupiter & Neptune, and its Element is water. It is quite beneficial for those who work for large companies, are teachers or in the medical and care-giving fields. Its energy assists in creating a group willingness to work together. This crystal is currently being used to correct localized energy disturbances. What I like to call "icky energy spots." It dissolves the spot and replaces any disorganized energy with a calm, consistent energy which discourages further disorder. Spirit Quartz has been used for astral projection and for dreaming. Placing one or more under your pillow at night increases and intensifies your dream state.